Education professor Jerine Pegg holds a tiny red wiggler. Pegg brought a box of the earthworms to a group of students in Nunavut to keep their composting project alive. 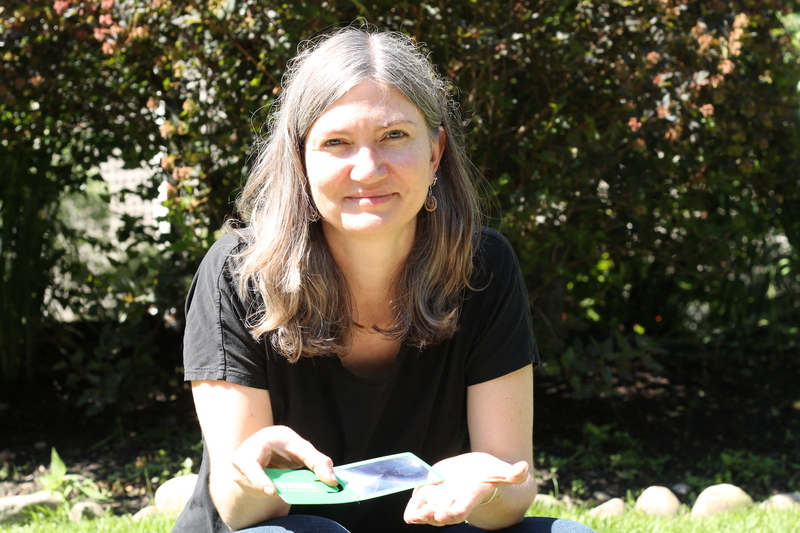 Not everyone would take a box of worms through airport security for the benefit of students learning about composting in Canada’s North, but that’s exactly what Jerine Pegg did this past spring. Pegg, a professor in the Faculty of Education, travelled more than 2,360 kilometres to Arnaqjuaq School in Hall Beach, Nunavut, to evaluate a Let’s Talk Science program focused on supporting science, technology, engineering and mathematics education in northern communities. When Pegg heard the students’ red wiggler worms had died, she packed more with her so they could start composting again. “The school’s composting efforts will turn organic waste such as banana peels or paper into nutrient-rich soil for the gardening project,” explains Pegg. As a professor focusing on science education, Pegg believes the best way for students to learn is for teachers to bring realistic, hands-on science into their classrooms, even if it means taking local red wigglers onboard a plane with her. Pegg originally became involved with Let’s Talk Science—an award-winning, national charitable organization—four years ago when she was looking for a context to continue her research on teacher-scientist partnerships. This trip was the first of a series of case studies she is conducting to examine the impact of these programs in various schools in Nunavut, Northwest Territories, northern British Columbia and northern Alberta. Over the past two years, Let’s Talk Science has been visiting Arnaqjuaq School running in-class activities with students and workshops with teachers. As a part of one of these workshops, teachers at the school decided to start a school-wide gardening project by composting and growing a few plants. Next year the school plans to grow plants in every classroom and eventually build a greenhouse. Beyond inspiring scientific thought and curiosity, the program is having an impact in other subject areas. For example, the school’s business teacher hopes to use the project to engage students in calculating the cost of growing the produce in the greenhouse versus buying it from the Northern Store. For Pegg, this shows precisely why it is important to encourage students to get their hands dirty with authentic science.